Use mindful sequencing and conscious breathing when working with clients who are managing pain. Like most Pilates instructors, I’ve worked with many clients who deal with chronic pain. One of the most challenging and common conditions I see is arthritis. Arthritis, which is joint inflammation, is most likely to occur in joints with a wide range of motion—fingers, elbows and knees, for example (CDC 2001). Arthritis causes pain and stiffness in the affected joint. For some, the inflammation, pain and stiffness can make the simplest movements—such as tying shoelaces or opening food containers—daunting or even impossible. Arthritis is not a single ailment; it encompasses more than 100 different diseases, including osteoarthritis, rheumatoid arthritis, gout and fibromyalgia (CDC 2011). Altogether, these diseases affect 1 in 5 Americans, or more than 50 million people in the United States, according to the Centers for Disease Control and Prevention (2013). The most common type of arthritis is osteoarthritis (CDC 2010), which accounts for more than 85% of arthritis cases (Van Manen, Nace & Mont 2012). With osteoarthritis, the cartilage that cushions the ends of bones deteriorates. When this happens, bone rubs against bone, causing pain. 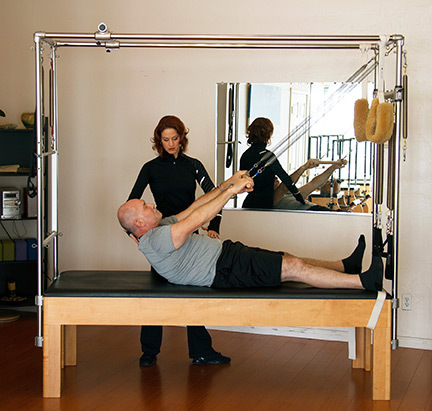 This article focuses on the benefits that Pilates offers and how I helped a client with arthritis manage his condition. A strong Pilates practice, along with a good diet and proper medical treatment and oversight, can aid in reducing muscle stiffness, easing joint pain and improving joint mobility. Many people who have arthritis shy away from exercise because they feel the intensity may be greater than their bodies can handle. But Pilates is different from other exercise formats because its gentle movements are purposeful and stabilizing. Reclining on the apparatus is low-impact and helps prevent stress on joints, ligaments, and the cartilage surrounding joints. Stuart, a 54 year-old male, has been diagnosed with both osteoarthritis and fibromyalgia. Stuart was once very active in outdoor and indoor cycling, strength training and yoga. His normal activities became painful and extremely difficult to perform. He turned to Pilates as an alternative to keep his body active and strong without causing the same kinds of pain the other activities caused. Stuart has found that coming into the studio three to four times a week has not only helped him stretch, strengthen and maintain muscle without pain; it has also improved his mood and overall well-being. Here are some exercises that worked for him. I always start Stuart on the trapeze table because it gives him ample support and plenty of options for stretching and finding his core strength before we move to the reformer. We start with roll-downs, using the wooden hand bar as support (with extra spring load) so he can pull deeply into his abdominals on the way down as well as on the return. Next, I turn Stuart around, and he places his feet against the legs of the trapeze table. With the metal bar serving as support (from the top with one red spring), I aid him in flexion, stretching the bar as far forward as possible (legs parallel and straight). He then lifts the bar high overhead and stretches his spine into extension. After about three sets, I have Stuart place one hand on the metal bar (center) and reach the other arm across in opposition for a twisting stretch, making sure his hips stay square. Because it is difficult for him to reach all the way across without bending his knees, I put a towel around the table leg as slack to allow him to get a better stretch with straight knees. I then have him lie underneath the metal bar, still supported from the top, but this time with two red springs. Stuart performs a supported teaser by bringing his torso up with the bar while keeping his legs bent (parallel and hip-distance apart) and feet planted. I find it’s important to have Stuart find his core before moving to the reformer, so that his actions are supported and not joint-heavy. 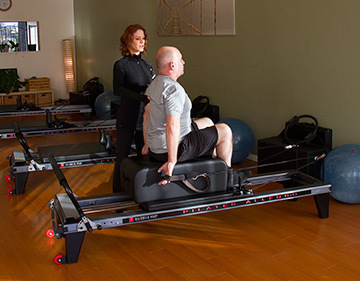 Once Stuart feels stretched and more able to move freely, we go to the reformer. I lead mostly closed-chain exercises, with assistance from springs and straps, to ensure more stability in Stuart’s movement. After double-leg footwork in all positions, we take a moment and use a resistance band for more-supported stretching. Stretching between exercises helps Stuart release unwanted tension. Next we move to the midback series with hands in straps. I watch Stuart’s position closely during these open-chain exercises. I cue him to keep an imprinted position with legs in tabletop, and then I lead him through a flexion series. After the midback series, I place the straps on his feet. There is a saying that “motion is lotion” for joints. I feel all movements in the straps help lubricate the hip joints, a primary place of pain for Stuart. We use appropriate resistance to avoid pain while also providing enough spring load for support. Next, I guide Stuart to a seated position on a box for arm work. He often walks into the studio hunched over in pain, his posture clearly compromised. I therefore make sure we work on strengthening his back muscles. Much to my delight, Stuart often walks out appearing straighter and taller. On a good day, he performs long stretch. This plank position strengthens and develops so many muscles in the body, especially the abdominals. Cooling down is important for all clients, but especially for those who suffer from chronic pain. The cool-down may include Eve’s lunge (a great stretch for maintaining hip mobility), elephant, or something as simple and calming as child’s pose. Important note: Clients who are dealing with pain (especially fibromyalgia) tend to disconnect from their bodies by holding their breath or closing their eyes. Make sure clients breathe properly, keep their eyes open and are conscious of every movement. Hopefully, they will learn to breathe through their pain outside the studio as well. CDC (Centers for Disease Control and Prevention). 2001. Prevalence of disabilities and associated health conditions among adults—United States, 1999. Morbidity and Mortality Weekly Report, 50 (7), 120-25. CDC. 2010. Prevalence of doctor-diagnosed arthritis and arthritis-attributable activity limitation—United States, 2007-2009. Morbidity and Mortality Weekly, 50 (7), 1261-65. CDC. 2011. Arthritis. www.cdc.gov/arthritis/basics/faqs.htm; accessed Feb. 7, 2014. Jennifer Curry Wingrove, owner of Pilates On Park, California Ballet Company ballerina and STOTT Pilates Certified Instructor, initially became interested in Pilates to further strengthen her own body for her international dancing career. She was so impressed with what Pilates did for her that she became inspired to teach and share this form of exercise with others. Learn more at pilatesonpark.com. ... read more.